All images, numbers, graphs, amounts, currencies and any other representations are for illustration purposes only. The historical data graph shows the most recent data changes for the asset you have chosen. The scale is 5 minutes (default), 1 hour or 24 hours. 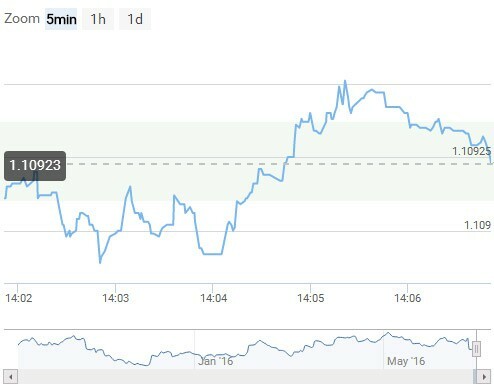 The scale differs from the scale in the trading window, so that you can see detail (5 minutes) or a longer price history – depending on how you plan your investments. The current price is always in the center of the screen, so that your trading is in a stable space in the trading window. You can also optimize your view by changing the scale using the slider at the bottom of the historical data graph. Most investors configure their trade by simply grabbing the edges of the orange trading box and sliding the limits up/down or left/right. Your trade can commence 60 seconds or more after the current time. You can set your trade to expire anytime during trading hours, but not later. For a successful trade, the price must enter the cuboid (the orange area) from the left, remain in the cuboid, and then exit the cuboid on the right. This means that the price must remain below the maximum value, and above the minimum, from the moment the trade commences to the expiry time. You can see the potential return on your investment expressed as a percentage in the cuboid. For example, if you intend to invest 100 and may receive 153 as your return, then you will see 53% as the potential value increase. You can also set the commencement time and expiry time by using the sliders at the bottom of the trading window. Instead of grabbing the orange box edges, you can also grab the grey boxes to change the maximum range value or the minimum value. Select your favorite asset class and asset type from the dropdown lists. We will add more assets and asset classes as more data feeds become available. The visible assets will always only be assets that are available for trading immediately. If the market for an asset is closed, the asset will not be shown. You can configure your trade numerically instead of graphically if you prefer the detailed control of your trade. Select your asset class by using the Class dropdown selection feature. You can choose between Currencies, Indices, Commodities and Sentiments. All the main currency exchange rates are available for you to trade on. You can trade on the dominant global indices. We will add more commodities and have three commodities for you to trade on now. The derivative feeds are based on market data from leading market data feeds. This is where you trade by selecting Trade Now! You can configure your trade numerically instead of graphically if you prefer detailed control of your trade. You choose the delay until your trade starts by using the Start window. Your trade can start anytime from 60 seconds until the market closes. 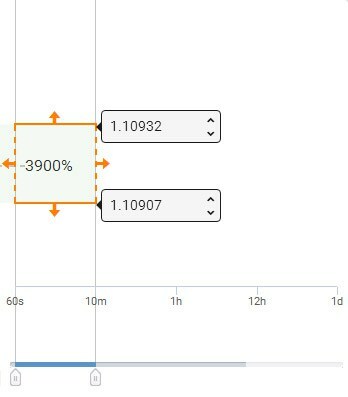 In the example here, your trade will start 1 minute from now. You choose the expiry time in the Time left window. In this example, the time left is 10 minutes from now. The Expiry window shows you at what time the trade will expire if you Trade Now. Please check the time zone where you are. For your investment to be successful, the price must be below the Max price you set in the Max window from the Start time to the Expiry. If the price goes over the Max price at any time between the Start and the Expiry, your trade will fail. For your investment to be successful, the price must be above the Min price you set in the Min window from the Start time to the Expiry. If the price goes under the Min price at any time between the Start and the Expiry, your trade will fail. The Current window shows you what the current price of the asset is. You set your investment in the Investment window. You see the amount a successful investment would yield. And select Trade Now! You can see your live trades in the Open Positions window. And you can see your previous trades in the Trade History window. If you click on an Open Position or a Historical Trade, you can see the trade details in the Investment Live window. If you click on an Open Position or a Historical Trade, you can see the trade details in the Investment Live window. 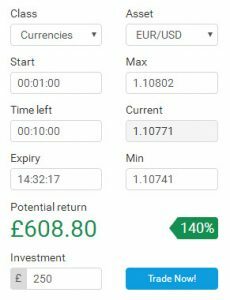 You can also exit trades early in the Investment Live window.